As mammals, hamster diseases in some cases are similar to those found in dogs and cats, as well as a few conditions that are unique to them. Because hamsters are so small, they are more difficult to observe and it can be tricky to tell when they are not feeling well. For this reason, hamster owners should be familiar with common diseases of pet hamsters, and should be comfortable with performing a general physical exam of their pet and monitoring for signs of illness. All of the conditions described below require veterinary care and cannot be cured with other the counter medications. One of the most common serious illnesses that hamsters are known for is an intestinal infection commonly referred to as ‘wet tail’(known as an enteric or intestinal disease). The disease is thought to be caused by a bacterium called Clostridium perfringens jejuni, in combination with other factors, such as stress from shipping, exposure to infected pets, over-crowding and poor diet. The term ‘wet tail’ simply refers to the fact that the disease causes a profuse, watery diarrhea. The diarrhea caused by wet tail causes severe dehydration and can be fatal in a matter of a few days if not treated. Treatment of the disease includes fluid administration and antibiotics. Even with treatment, many hamsters affected by the disease will die. Monitor your hamster’s feces closely for signs of diarrhea, especially when you first bring the hamster home, or when adding an additional hamster to your household. Fighting among hamsters or other skin trauma from a defective cage can cause a skin abscess. These usually occur around the head. The skin wound can introduce bacteria such as Staphylococcus auyreus, Streptococcus spp, Actinomyces bovis and P. pneumotropica. Hamsters are also prone to diseases of the teeth and cheek pouches. Because they have continually growing teeth, hamsters need to have appropriate chew toys and diet to wear down their teeth and keep them at an appropriate length. If the teeth are not properly worn, or if the hamster suffers from a jaw disorder such as malocclusion, the teeth may grow to an inappropriate length, making eating painful and difficult. Overgrown teeth can cause the hamster to lose weight and become thin and malnourished, and can even lead to death. Impacted or abscessed cheek pouches are also fairly common in hamsters. Check your hamster frequently for signs of oral disease, including weight loss, swollen or painful cheek pouches, difficulty eating, or teeth that are inappropriately long. If you are concerned that your hamster is having difficulty eating and losing weight but don’t see anything obviously abnormal, you will need to consult a veterinarian who can use a speculum to see the animal’s cheek teeth and perform a more thorough examination. Viruses in hamsters are rare. When hamster viral infections do take hold, such as the adenovirus, they often do not cause noticeable symptoms. Other viral infections found in hamsters include the Sendai, PVM (pneumonia virus of mice) and LCMV (Lymphocytic choriomeningitis virus) viruses. Although rare, the LCMV can spread from hamsters to people in the air and via direct contact with an infected animal. Symptoms in people may not be noticeable or look like the human flu or meningitis. Symptoms in people include fever, stiff neck, headache, muscular pain and malaise. Demodetic mites (also called Demodex aurati and Demodex criceti): Mites are the most common parasite found in hamsters. 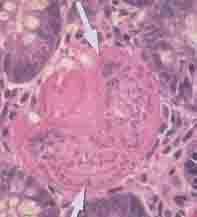 Example of Hamster Cancer Cell. 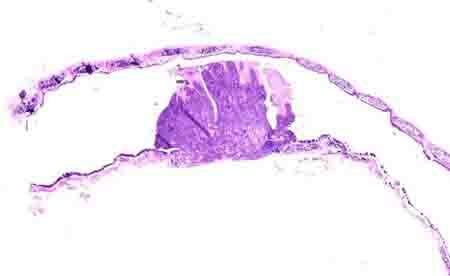 Invasive squamous cell carcinoma, trachea of a hamster. Hamsters are susceptible to basically any of the diseases that other mammals can acquire, such as kidney disease, heart disease, and many types of cancers. Respiratory disease can be caused by the bacteria Pasteurella pneumotropics. Srepttococcal bacterial hamster infections can cause pneumonia, cervical lymphadenitis, mastitis and septicemia. By becoming familiar with your hamster and what is normal for the animal, you can increase your chances of catching an illness before it becomes severe. Daily monitoring of your hamster’s appetite, activity, attitude, body condition, and feces can tell you a great deal about your pet’s health status. If any concerns are noted, be sure to contact a veterinarian right away. Because hamsters are so tiny, it doesn’t take much time for their condition to deteriorate to critically ill.
Frisk, C. S. 1987. Bacterial and mycotic diseases, p. 112-131. In G. L. Van Hoosier, Jr., and C. W. McPherson (ed. 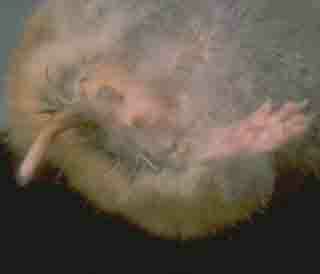 ), Laboratory hamsters. Academic Press, Inc., Orlando, Fla.